Thank you so much. This thing was driving me crazy, it was your tip to restart X11 that did the trick. (only now I realize that the settings dialog explicitly say that a restart is required. Shame on me). Won't "ssh -X" do the same thing, and you won't need to use xhost? xhost is not very secure. Much better to tunnel things through ssh. And what about all the way around? 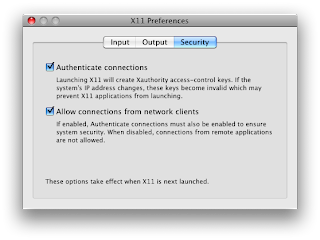 Can i access my Mac using X11 forwarding from another Mac (or even from a linux machine)? Great this is what i wanted..works great.